Referrals are an important part of any successful business and shouldn’t be overlooked. Referrals don’t just happen, though that would be wonderful. You need to be creative, persistent and implement a strategy to generate them. Are you providing exceptional customer service, going above and beyond and leaving your clients impressed? If so it’s time to begin the referral process and see what happens! Word of mouth is one of the most powerful ways to propel a referral. Who doesn’t love hearing about a great product or service from a reliable, trustworthy source? Think of a time when you had a bad experience. I’m sure you shared negative feedback with anyone who would listen. And, I’m sure it left you with a bad impression for a while. But, what happens you when you have a positive experience? When you’ve exceeded client’s expectations they’re more than likely to share their feedback in a positive way. In fact, according to a study published by Nielsen, 84 percent of consumers say they trust recommendations from friends, family and colleagues about products and services. So, go ahead and exceed your client’s expectations so they can brag about you. There’s only good to come from it. Follow up with your existing clients as soon as your product and service is delivered. Send a hand written thank you note, along with a small gesture of kindness. Do they like to golf? Send them a golf ball. Are they an avid reader? How about a latest best seller? Are they a workout fanatic? Send them a unique water bottle. If expectations were exceeded, ask your clients if they know of anyone else that might be interested in your products or services. It’s important to show them that you appreciate their business. Don’t expect a referral every time, but every couple of times will be fantastic for building a pre-qualified customer base. Think of it like a love engine that keeps on giving you business. Cherish your clients and who they refer to you. Be grateful on a daily basis and build connections for life. I’m a big believer in the power of karma! It’s not all about asking. To circulate positive energy you need to give to get. Try giving a referral for no reason or just because — as a simple act of kindness. Karma is the Law of Cosmic Cause and Effect meaning what comes around goes around. The more you give, the more you will get. Do you like your graphic designer? Printer? Promotional partner? Event planner? Give a referral to a business colleague. Not a believer of karma? Everyone has a story. What’s yours? Social media is an important part of our daily business and especially with the millennial market, it’s a must to be active. LinkedIn is a powerful networking tool for referral marketing and often underutilized. Spend a few strategic hours each week on LinkedIn and you’ll be amazed at the results. First, make sure you have a LinkedIn page that you’re proud to promote. Are you looking to target a certain industry or company? Put together a list of three to five businesses you’d like to contact do a quick search and see who in your network is connected to the them. Send your contacts a note through LinkedIn and ask for an introduction. Hopefully your connection will respond favorably and you can move forward with your request. It’s as easy as that! Interested in a few other ways to boost your referrals and recommendations with social media? Post updates daily, celebrate your colleague’s successes and accomplishments and follow your prospects and clients on platforms that are a part of your normal business promotion. Show interest to gain interest! 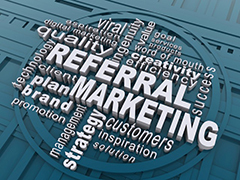 Referral marketing is a positive tool that helps you build business and get results. Keep in mind this does take time but the results will be well worth your effort. Make a commitment to take a couple of these referral strategies and implement them, in ways that work for you. Once you have a system in place, you’re on your way to new leads, potential partners and customers who want to give you business.